yoga | Learn. Experience. Share. I was originally taught and used to think a meditation practice had to be sitting tall with the legs crossed focusing on a mantra with no other thoughts for 30 minutes. I have since learned that is all BS. to someone guide you because you don’t have to do it alone. Lately, I’ve needed to do the later. I share with you guided meditations! I am not endorsed in any way for this but I have been using Insight Timer. I’ve been listening to the meditation featured in the screenshot image, “Healing Through Letting Go,” at least twice a week. I listen to Yoga Nidra to fall asleep. I sometimes listen to a 5 minute meditation to get my day started. The experience of meditating when I start to feel overwhelmed, tired, or upset helps to alleviate those feelings. I usually, not always, but usually come away from meditation with a clearer head and calmer body. I’m not perfect at meditating every day. No one is. But I’m perfect at practicing to do it every day for whatever amount of time. I hope you can too. Balance poses, in general, offer a calming effect on the body because of the focus (or drishti) that is needed. In order to maintain your balance, the recommendations are to focus on a non-moving, eye-level (or above) spot, and to breathe steadily. In my opinion, Tree Pose (vrik-SHAHS-anna) is a great pose to start with because of the options for modifying which develop balance and concentration. As the different variations are explored, legs and feet are strengthened providing increased flexibility in the hips. Exploring arm placement can lead to an opening of the chest and toning of the shoulder muscles. I like to practice this while doing the dishes or brushing my teeth at night, in addition to incorporating it into my regular practice. There are a few things that I find myself repeating to people interested in yoga or to new students. The first thing people say to me is “I’m not flexible.” My answer to that is you don’t have to be flexible, it’s about becoming flexible. Closely related to that is “I can’t do ____ (fill in with any yoga pose).” Again, it’s not about that. I choose not to do a lot of the “tricky” poses for reasons that will be discussed later. Lastly, I hear that the teacher had them do something they didn’t like or that hurt. My response is that you don’t have to do every single pose the teacher offers. It’s your body and your practice; you know what you are comfortable doing. I tell my students they don’t get extra points for doing everything I say, except when it comes to safe alignment; outside of that, take care of your own body. Yoga is a lifestyle practice that has been around for many, many years. There is great wisdom behind the philosophy that is not learned overnight. I do my best to explain my experience below based on my current understanding of what I have learned as I continue to study yoga. 1) sit tall in a comfortable position. 2) feel the connection of your sit bones on your chair/ground/etc. 4) close your eyes and continue to breathe. As you breathe in notice, that you are breathing in; as you breathe out, notice you are breathing out. What transformation did you experience? Yoga is more than your physical practice (aka asana). Yoga is not a religion. It is a journey to oneself, connecting the Higher Power (whatever name you give). It is a spiritual practice. Yoga gives you the tools to move from a place of imbalance to balance. If your yoga practice expands you and gives you joy, then it is the right yoga practice for you. The best yoga practice is when it is integrated into your life. Namaste! Yoga gives you the tools to move from a place of imbalance to balance. Yoga‬, or actually ‪‎asana‬, doesn’t mean you HAVE to wrap yourself into a pretzel, or look like the models on the front of the yoga magazine (any magazine for that matter) or eat a certain diet. It’s about surrender. It’s about love and life. It’s about taking time for yourself. It’s about calming the body and mind. It’s about doing what feels good in YOUR body. Ultimately, it’s about preparing yourself for ‪meditation and being with your true self, bowing down to your higher self. Balasana (BAH-las-anna), or child’s pose, is a basic kneeling forward bend, bowing and surrendering. I always tell my students that you will have a love/hate relationship with Downward Facing Dog (Adho Mukha Svanasana ‘AH-doh MOO-kah shvah-NAHS-anna’). As a beginner, you will hate it. It is considered a resting pose, but won’t feel like one until you build up strength in your shoulders and core. The love relationship will come when you realize how it lengthens, strengthens and stretches the whole body, especially the back part of the body: ankles, calves, hamstrings, upper back and shoulders. Meditation is important to me. For a beginner, it can be intimidating. It doesn’t have to be. It can be frustrating too because there’s a misconception that you won’t have any thoughts, at all. Just so you know, this is what usually happens for most of us, especially at the beginning. Here’s the easiest way to start and how I begin every yoga class I teach. Find a way to sit comfortable, on a chair, sitting up in bed, sitting cross-legged. We aren’t going to be concerned about form right now. Read through the following and then do at least once a day. Take a deep inhale through your nose, exhale through the mouth. Breath in through your nose and out through your nose. Continue until you hear your timer. Notice any sensations in your body. Let your eyelids flutter open. You are done. Easy right? YES!! The word chakra [chuhk-ruh] translates as “wheel” or “disk” and refers to a spinning sphere of bioenergetics activity, vital energy, or life force. There are many of these life forces located on different parts of our bodies, major and minor chakras. 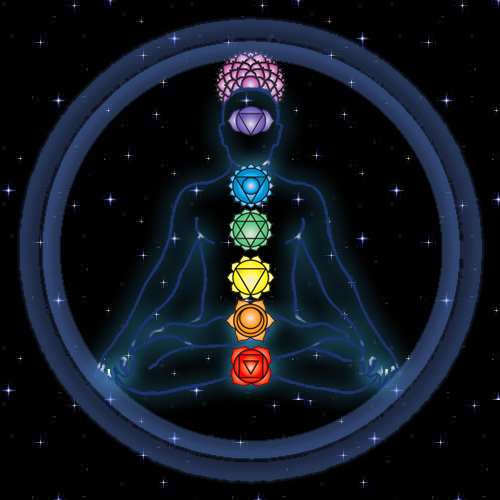 For my purposes, I will be focusing only on the seven major chakra system stacked along the spine, starting at the base (Chakra One) and ending at the crown of the head (Chakra Seven). These main chakras send energy up and down our body and like any transfer system, it can get blocked (deficient) or spring a leak (excess). There are ways of clearing and healing these elements so that the life force can continue to flow, giving us the energy we need to live each day to the fullest and manifest our true selves.